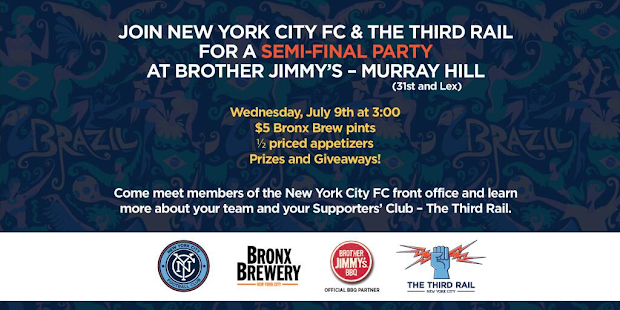 NYC is Blue: Today's the Day - World Cup Semi-FInal Viewing Party at Brother Jimmy's! Today's the Day - World Cup Semi-FInal Viewing Party at Brother Jimmy's! Don't forget - today is the day for the Third Rail's Semi-Final Viewing Party, co-sponsored with New York City FC itself! Germany punched its ticket to the final in dramatic fashion yesterday with a decisive 7-1 thrashing of Brazil. Now it's time for Argentina and the Netherlands to step up; which one will win the right to face Die Adler in the Estádio do Maracanã on Sunday? Our viewing party will be at Brother Jimmy's BBQ on 31st and Lexington in Manhattan. The match starts at 4:00, the party starts at 3:00! We'll have beer specials provided by our friends at the Bronx Brewery. There will also be half-priced appetizers, prizes and giveaways, and the opportunity to watch the match with NYCFC staff. There will be an opportunity to sign up for the Third Rail (if you haven't already), and a special raffle for Third Rail members. Join the Third Rail Today!